Congrats to Bren @BG_Garden for being the winner of my first giveaway! Runner up prize went to @jchapstk! Thanks to all that entered! ***UPDATE*** David Moffett, owner of www.dollarseed.com , thought this giveaway “is an awesome idea, and very generous”, so much so that he decided to join this virtual “garden party” by throwing in some seeds to the runner up! You can learn more about Dollar Seed by following them on Twitter @dollarseed and “liking” them on Facebook. Thanks for adding to the fun David!!! 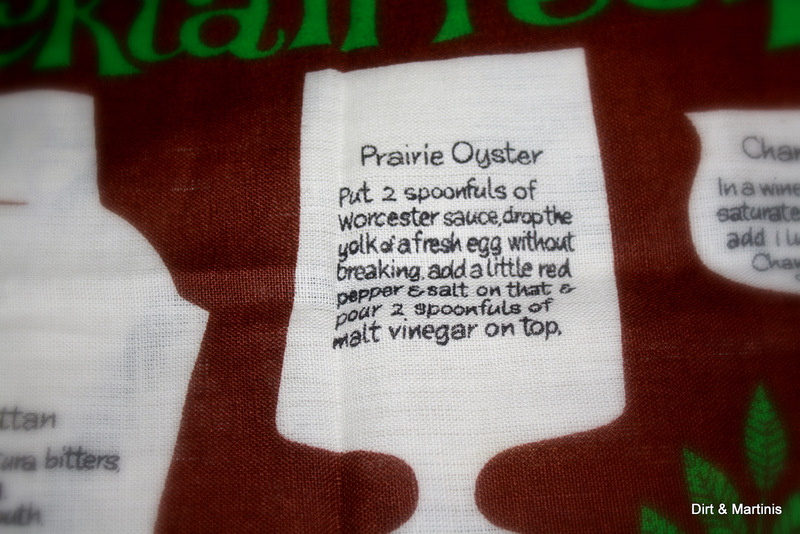 On a recent thrifting excursion I came across two vintage, all pure linen, “Cocktail Recipes” towels made by Ulster. After doing some research on the Ulster company I learned that the towels I purchased were most likely from the 1960′s and similar to the towel sold here on Etsy. According to The Ulster Linen Company’s website and Facebook page I’ve discovered that they are the premier wholesaler of fine European linens since 1933! Both towels are in excellent condition and in my opinion have never been used. 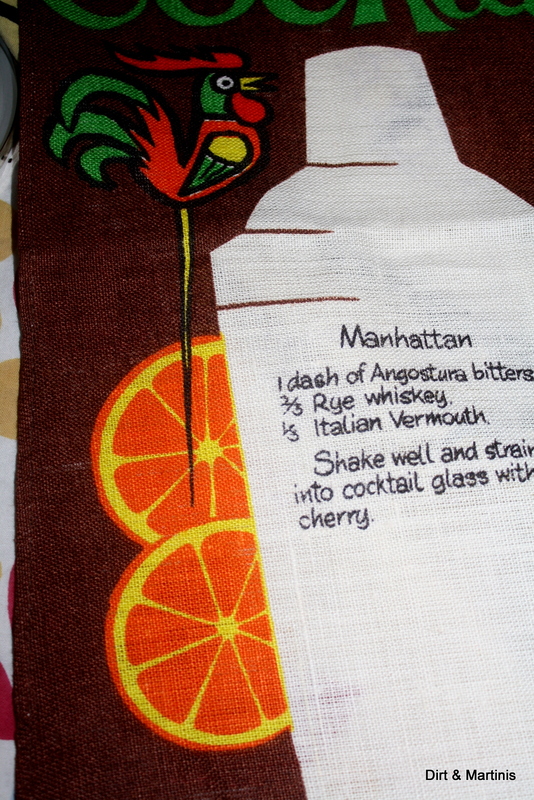 Being a lover of graphics, fonts and, ahem, cocktails I knew immediately that one of these towels was going to end up in my kitchen. What is going to happen with the second one? Well, hopefully it’s going to end up in YOUR kitchen. So, won’t you join me in my first giveaway? Let’s have some fun! First, leave a comment on this post saying you want to enter. 1. ”Like” my Facebook Page If you have done this previously let me know here or on my Facebook page and then you’ ll qualify for an additional entry. 2. Share the link to this contest by posting it on your Facebook page and you’ll qualify for an additional entry. 3. 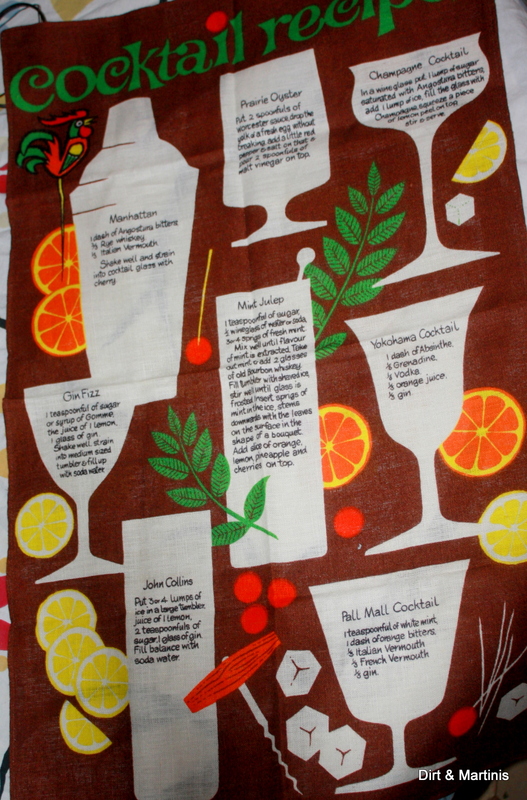 Follow me on Twitter @dirtandmartinis and tweet “@dirtandmartinis is having a vintage “Cocktail Recipes” towel giveaway http://dirtandmartinis.com/2011/11/15/my-first-giveaway-an-ulster-vintage-cocktail-recipes-towel/ ” and this will qualify you for one additional entry PER tweet. Been following you on FB forever Have shared on FB and reTweeted. Love these ! They were quite a find ! I follow you on FB too ! Thanks Dawn! You are entered in the contest! Woot! Yay Kim! Thanks for your support. You are entered in the giveaway! Hi Susan! Haha, you are a hoot! Keep tweeting for extra entries! I already like you on Facebook. Love your page! Thanks so much Denise! You are entered in the giveaway! Did you see that http://www.dollardseed.com has thrown in a prize for the runner up? Woot! I’m in! I already love you on Facebook and follow you. I’ll go RT now!! What a great, original giveaway. I hope I win!!! Aw, you’re so sweet Genevieve! I’ve entered you in the contest garden/cocktail friend. Thanks for sharing on Twitter too! I can see this hanging in my kitchen! 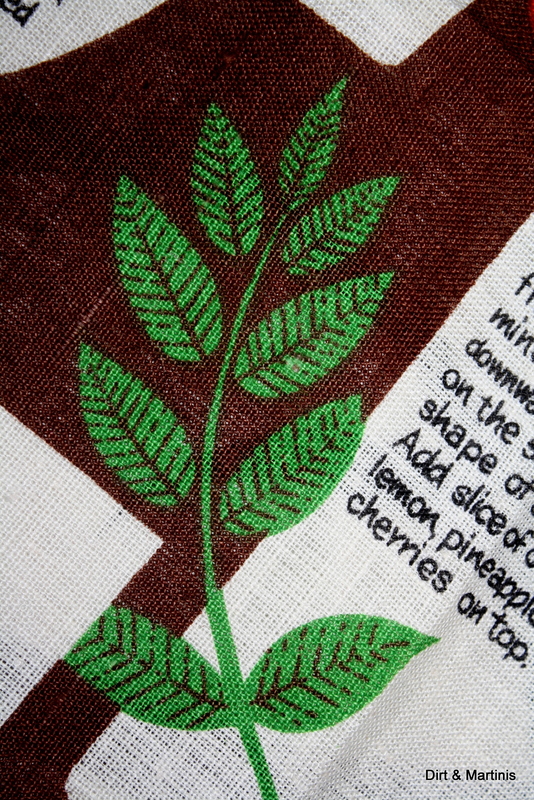 Great give away and I can’t wait to share it with everyone on the #gardenchat network! Isn’t cute Bren? I’ve entered you in the contest and thanks for sharing on Twitter.! I’ll announce the winner right after next Monday’s #gardenchat. Woot! LOve these! I liked your page a while back. Pick me! hahaha! Haha! Thanks Cindy…you are entered! This is totally awesome! I’m all over it. I want those towels! What a great find. I hope I win, since I am your biggest fan! How about I just get out one of those herb infused recipes and hope I win, like the lottery. LOL. Good luck with your contest. Of course I want to enter! Thank you so much for offering such a cute and fun giveaway. I “like” you on Facebook – Cindy A.
I follow you on Twitter (@normawatson) and I tweeted. Such good finds – very cute! I’d love to enter! I also already follow you on Facebook, of course! I’m so embarrassed I didn’t notice last night that I was a winner! I think I tweeted your link and the other winners 100 times in the hour! LOL Thank you Nicky for including me. I don’t know how to tell you how cool it is to win something for myself!